In collaboration with several partner organizations, the Federal Deposit Insurance Corporation (FDIC) will be participating in a free Sandy Relief Clinic for homeowners, business owners and residents of New Jersey affected by Super-storm Sandy. At this forum, you can receive one-on-one assistance with FEMA, SBA, and insurance claims. 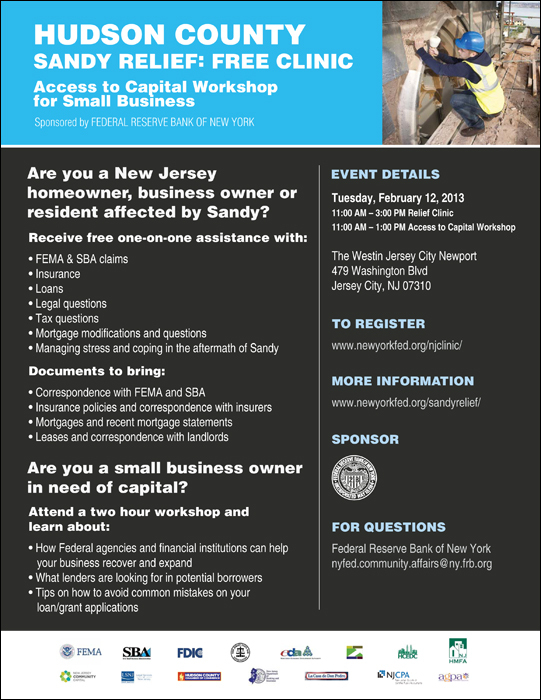 There will also be an Access to Capital workshop for business owners to learn about various financial resources to help your business recover and expand. For more information or to register for this event: www.newyorkfed.org/njclinic or www.newyorkfed.org/regional/sandyrelief/.